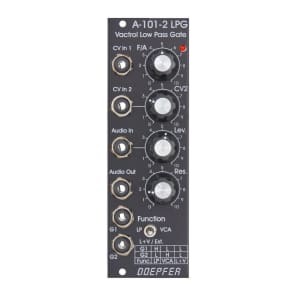 A-101-2 is a vactrol based combination of Low Pass filter (LP) and VCA and was inspired by the Buchla module 292. The term "Low Pass Gate" was created by Don Buchla and stands for a module that can be switched between low pass and VCA. The control (manually and via external CV) is responsible for frequency in the low pass mode and for loudness in the VCA mode. Additionally a combined mode LP+VCA is available. In this mode the sound becomes more dull as the loudness decreases. 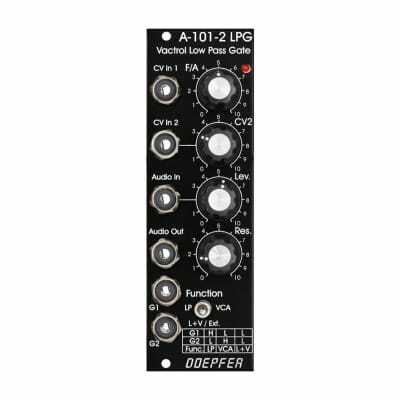 In contrast to the Buchla design the A-101-2 offers attenuators for both CV and audio input, a manual resonance control and two gate inputs to control the function of the module in addition to the manual toggle switch. 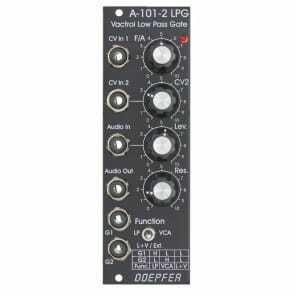 In principle the A-101-2 is a 12 dB low pass filter that can be switched to VCA or a combination of Low Pass and VCA. The controlling elements for frequency (LP mode) resp. amplitude (VCA mode) are so-called vactrols. Vactrols are known for their smooth sound behaviour. Because of the vactrol circuit the audio signal is not fully attenuated in the VCA mode at the minimum setting of the F/A control. The Frequency (in the LP mode) resp. the Amplitude (in the VCA mode) is controlled manually (F/A) and by the 2 control inputs CV1 (without attenuator) and CV2 (with attenuator). The audio input is equipped with an attenuator to enable distortion too (above ~ position 5 distortion is obtained with standard A-100 audio levels, e.g. VCO). The resonance function "colors" to the sound and is adjustable all the way up to self-oscillation. Resonance and consequently self-oscillation may vary with the filter frequency because of vactrol tolerances. Due to the circuit the resonance has a little bit an influence on the audio level (increasing resonance = increasing audio level). To obtain the original Buchla sound the resonance control simply has to be set fully counterclockwise. The function of the module is controlled by a manual switch. The left and right positions of the switch correspond to LP resp. VCA mode. In the middle position one obtains the combination of Low Pass and VCA. In this position it is also possible to control the function of the module by the two Gate inputs G1 and G2. The table printed at the front panel shows the connection between the gate levels (L = low, H = high) and the module function.